WOW – WHAT A GIFT!!! 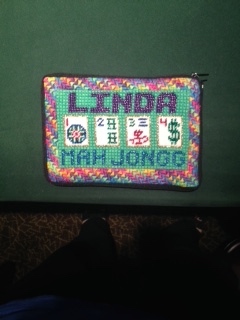 The dear, talented, and wonderful Linda Fink Steinger has sent me the most beautiful gift…something I will cherish for the rest of my life and will be using every time I play Mah Jongg. 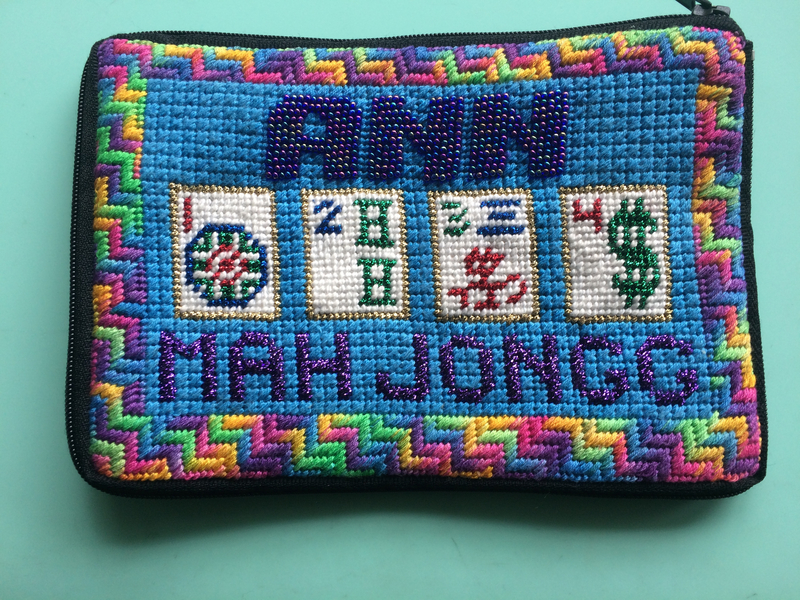 Check out this magnificent Mah Jongg bag she needlepointed for me – I am so touched by this exquisite gift that I cannot find the right words of thanks. 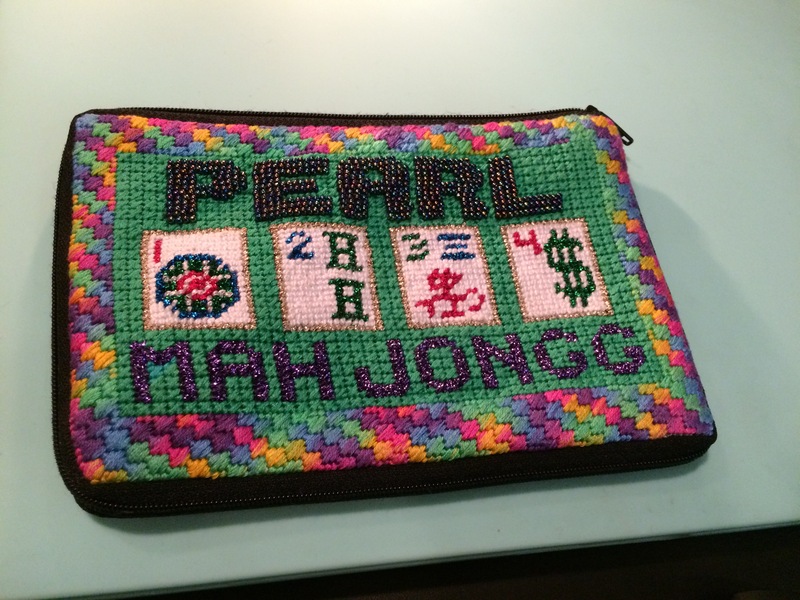 My name is needlepointed on with fabulous iridescent beads and the words “Mah Jongg” are needlepointed onto the bag with a wonderful “glitz” thread. I wish these photos could show the intricate and amazing detail. This bag is the perfect size for my NMJL card, my coins for all the games I lose (!) and anything else I might need to bring along to the game table. This entry was posted in Mah Jongg and Me and tagged 2015 card, glitz, iridescent beads, mah jongg, needlepoint, nmjl on April 10, 2015 by Mah Jongg and Me. 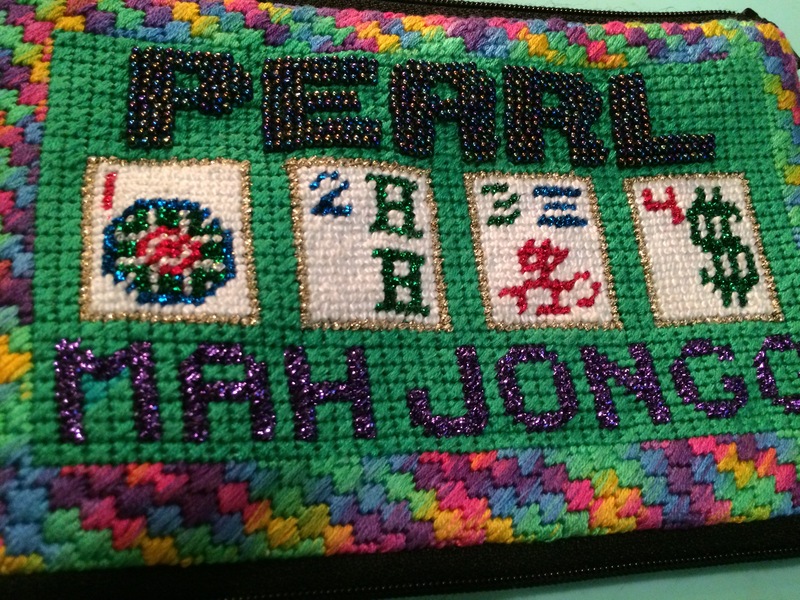 This entry was posted in Mah Jongg and Me and tagged 2015 card, glitz, iridescent beads, mah jongg, needlepoint, nmjl on April 9, 2015 by Mah Jongg and Me. 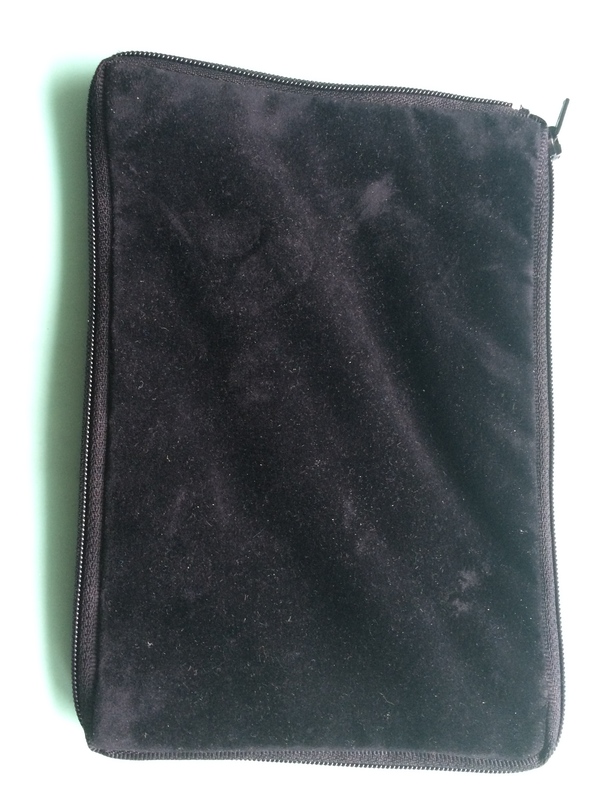 Plus postage and handling – $3.00. You can contact Linda directly at mahjbaglady@yahoo.com and discuss the colors you want and whether you want your name done in “glitz” or beads. Here they are again – these are very special, labor-intensive bags and you will be the talk of your Mah Jongg group when you show up with one of these! 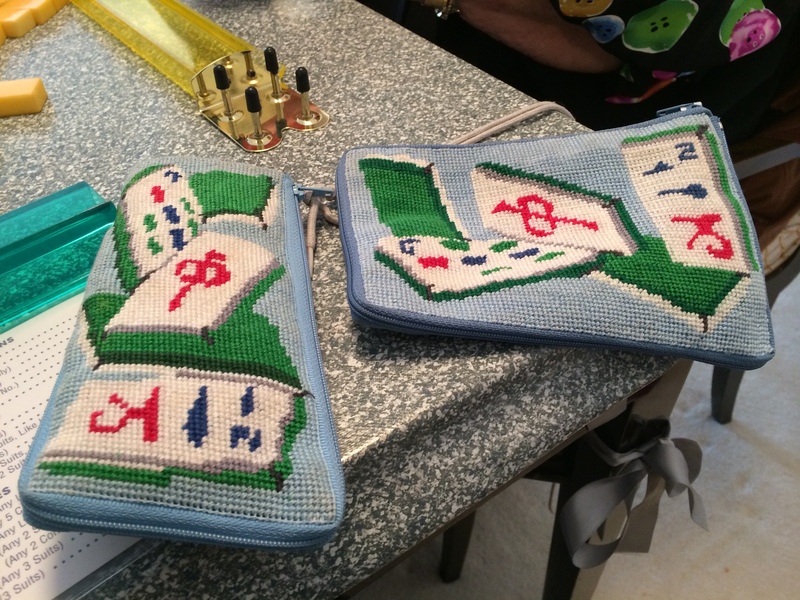 This entry was posted in Mah Jongg and Me and tagged mah jongg, needlepoint on February 26, 2015 by Mah Jongg and Me. 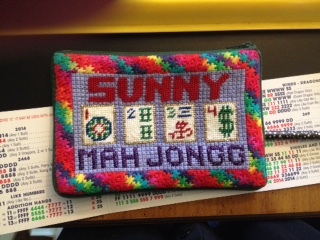 I have received so many comments and emails about Linda’s fabulous needlepointed bags and I have convinced her to start a business making these personalized Mah Jongg bags for any of you who might be interested in owning one. Linda has told me that they will hold the larger NMJL card but not the plastic protective sleeve that some of us use. 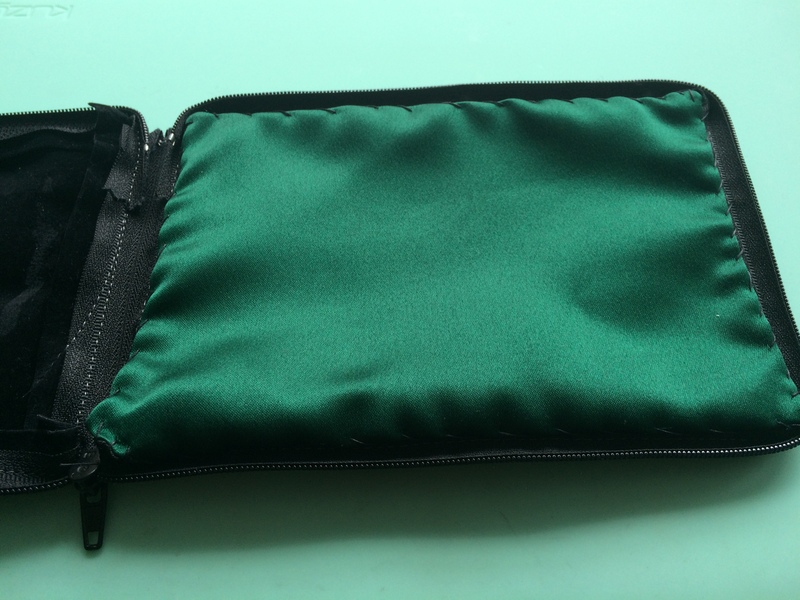 The bag is the perfect size for both the small or the large card, all of the change that we carry around to our games, and anything else you might need to take with you. Linda is out of town right now but has promised me that as soon as she returns she is going to open a PayPal account and will send me all the specifics on the bags. I suspect this will be very soon. In the meantime, while you are thinking about having Linda make one of these bags for you, take another look at the different colors you can choose and whether or not you want beads or glitz (as on the Peggy bag). 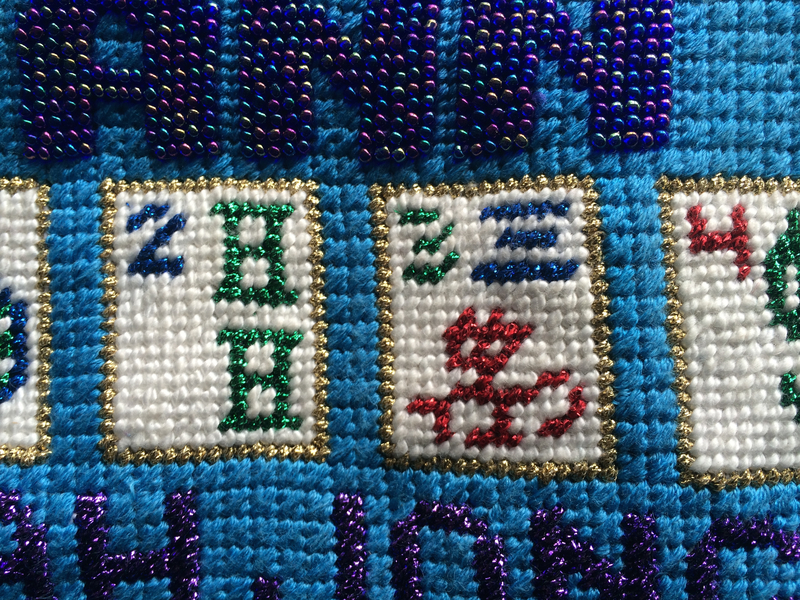 This entry was posted in Mah Jongg and Me and tagged mah jongg, National Mah Jongg League, needlepoint, nmjl, PayPal on February 25, 2015 by Mah Jongg and Me. My last day in Florida was yet another fun-filled day. I started out early in the morning by heading over to the Boca JCC where I received a warm and wonderful welcome by Stephanie Owitz, the Assistant Director of Art, Culture & Learning for the Phyllis & Harvey Sandler Center at the Adolph & Rose Levis Jewish Community Center. Stephanie is terrific and I hope to see her the next time I return to Boca (which I pray will be soon!). The turnout at the Boca JCC was wonderful with lots of old and dear friends showing up to hear my talk. My dear friend, David Fink, showed up with his wonderful girlfriend, Pearl. 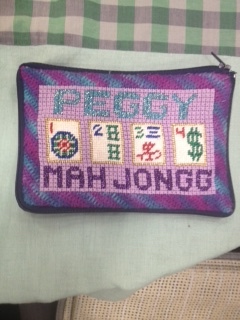 Jodie Knofsky’s dear mother Joyce showed up with a group of her Mah Jongg-playing friends. Deborah Korash, another dear friend from Detroit (and Camp Walden!) days showed up with her Mah Jongg group. There were almost as many friends there to support me as there were people who were just interested in hearing my talk and buying my book. It was so very special for me to catch up with all of these friends from my past and to meet many new people as well. Linda mentioned that she has been thinking about selling these beautiful personalized bags. 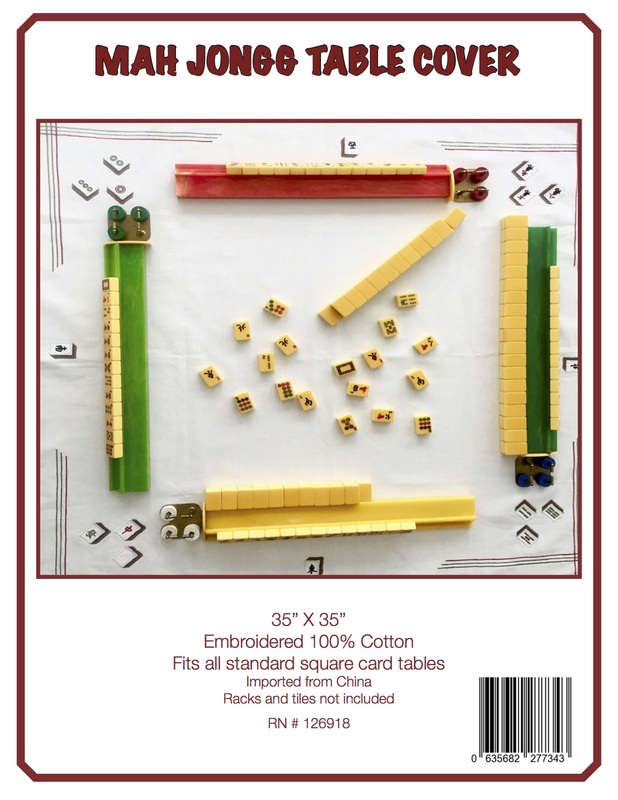 Let me know if anyone is interested and I will see if Linda is willing to do one for you (or for you to give as a fabulous gift for a Mah Jongg-playing friend!). After my talk and book signing, I headed over to meet my friends Lowell and Jay Van Vechten for lunch at a fabulous French bistro, Casimir, at Royal Palm Place in Boca. We had a delicious lunch and a chance to catch up on old times. Then it was back to the apartment, pack up, and head to the Ft, Lauderdale airport where I sat for about 5 hours hoping that my flight might actually take off for the frozen tundra of New York. 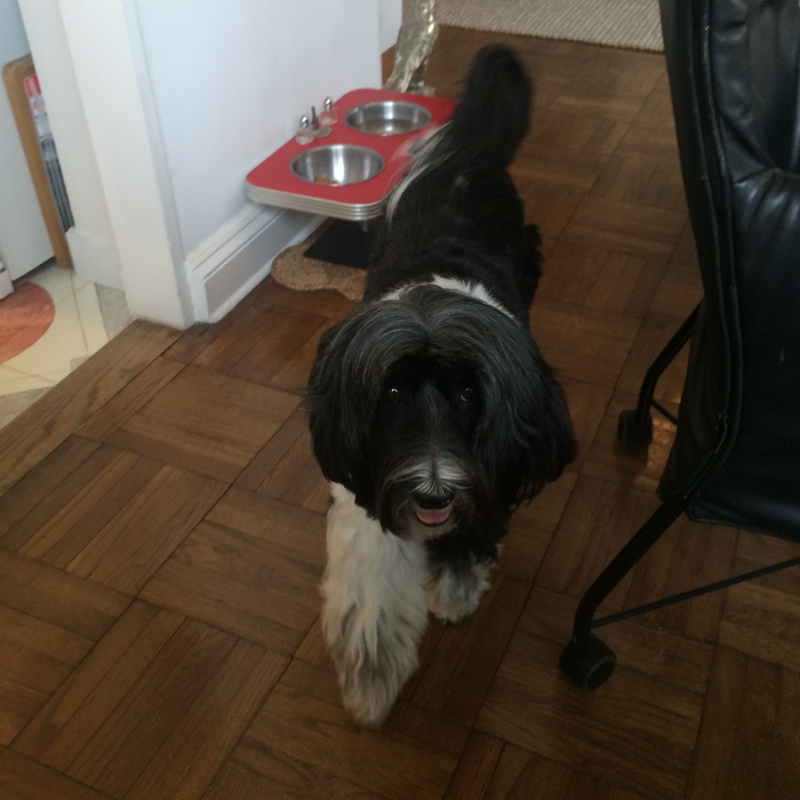 Part of me was definitely hoping that the flight would be cancelled and I could spend more time in sunny Florida but, in the final analysis, although it took seemingly forever, it was so good to be home and get a big kiss from Lizzie! This entry was posted in Mah Jongg and Me and tagged Boca JCC, Casimir, Ft. Lauderdale, mah jongg, National Mah Jongg League, needlepoint, nmjl, Phyllis & Harvey Sandler Center at the Adolph & Rose Levis Jewish Community Center, Royal Palm Place, St. Louis Jewish Book Festival on February 23, 2015 by Mah Jongg and Me. I was invited back to join in a Sunday game with some of the ladies who live in my building. This is serious game play since most of these ladies have been playing Mah Jongg for around 50 years. Playing with this group is great for my game – although not for my wallet! – because the games are played with lightning speed. You have to be really sharp to play with these ladies. The good news is that one of their table rules is that you can only lose $5 maximum during the day. 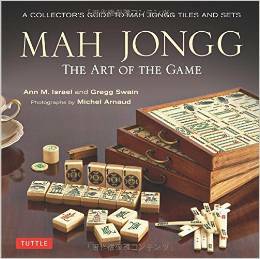 This entry was posted in Mah Jongg and Me and tagged bams, Charleston, craks, embarrassing, exposures, Florida, glasses case, Jokers, mah jongg, needlepoint, table rules on May 5, 2014 by Mah Jongg and Me.